It's official. McDonald's is back. Consumers and investors are ba da ba ba ba lovin' it. McDonald's reported fourth-quarter revenues and earnings that easily topped analysts' forecasts, led by a 5.7% jump in same-store sales in the United States. CEO Steve Easterbrook, who took over at McDonald's nearly a year ago, said the company's introduction of its all day breakfast menu in October was the main reason that U.S. sales did so well. 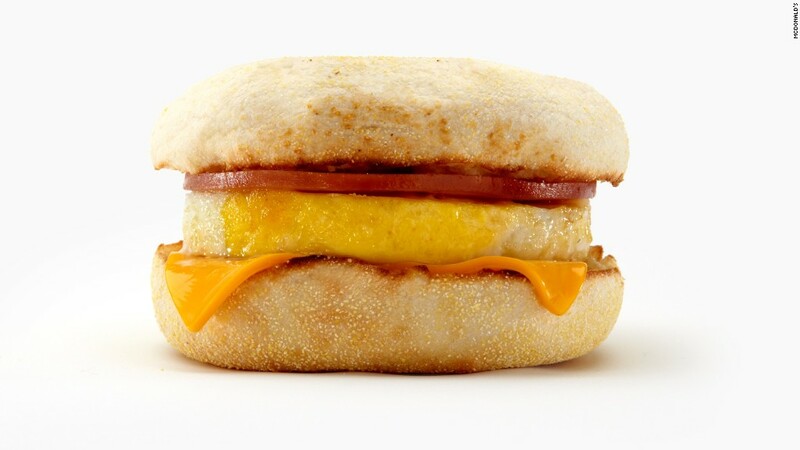 Many McDonald's fans had been calling on the company for years to make Egg McMuffins, hash browns and other early morning treats available at lunch or dinner time. The menu change clearly has paid off for Mickey D's. Easterbrook also said that mild weather in the quarter helped. This was the second consecutive quarter of domestic same-store sales growth for the fast food giant. But McDonald's isn't just staging an impressive comeback in its home market. Same-store sales rose 5% worldwide. The company said there was broad strength across Asia and Europe -- and solid sales gains in emerging markets like Russia and China. Shares of McDonald's (MCD) were up 1% in late morning trading Monday and hit a new all-time high. McDonald's was one of the top stocks in the Dow last year and has held up well so far in what's been a volatile 2016. McDonald's has outperformed rivals such as Burger King owner Restaurant Brands (QSR), Wendy's (WEN) and KFC/Taco Bell parent Yum Brands (YUM). It also has done better than some popular fast casual restaurants -- chains like Panera (PNRA) and Chipotle (CMG). Easterbrook deserves credit for owning up to many of the big problems facing the company -- most notably a stale menu that did little to excite the taste buds of its customers. Many diners were shunning McDonald's in favor of places like Five Guys, Smashburger and Shake Shack (SHAK). But since Easterbrook became CEO, McDonald's has added several new burgers -- such as the Pico Guacamole and Buffalo Bacon -- and also gave diners more choices so they could customize the sandwiches. It also launched a new Buttermilk Crispy Chicken sandwich. It was all part of Easterbrook's strategy to turn McDonald's into a "modern, progressive burger company" -- marketing jargon for tastier and fresher food. "We took bold, urgent action in 2015 to reset the business and position McDonald's to deliver sustained profitable growth," said Easterbrook in the company's earnings release Monday. During a conference call with analysts, Easterbrook said that all day breakfast sales exceeded the company's expectations. But he predicted that some of the euphoria will fade following the launch in October. That's one reason why the company is experimenting with other new menu items this year as well. It recently introduced mozzarella sticks and is considering launches of mac and cheese and sweet potato fries too. Neil Saunders, CEO of research firm Conlumino, said in a report Monday that the new offerings -- as well as all day breakfast -- has been "successful in attracting back lost customers, especially over the important lunchtime period." During the conference call, Easterbrook said the restaurant chain is definitely recovering market share it lost over the past few years and gaining customers from its burger rivals and other fast food (or quick service) competitors. The company is also trying to hang on to consumers don't want to spend that much when they go to McDonald's. Easterbrook said about a quarter of its customers are very value conscious. And that's a big reason why McDonald's has recently introduced a McPick $2 menu -- 2 items for 2 dollars. He also said the company will continue to invest more on better food quality and service to keep its momentum going.